Ahead of its Strategy and Financial Briefing in London, Nokia has shared some details on what it plans to announce at the event. As expected, the company is aligning its strategy with Microsoft. By now, you’ve probably seen the ‘burning platform’ memo penned by the fresh CEO of the world’s largest mobile phone manufacturer, former Microsoft executive Stephen Elop (the existence of the brutally honest memo was first reported by TechCrunch Europe and later published in full by Engadget). – Plans for a broad strategic partnership with Microsoft to build a new global mobile ecosystem; Windows Phone would serve as Nokia’s primary smartphone platform. Windows Phone to become Nokia’s primary smartphone platform = huge. Microsoft reportedly offered Nokia hundreds of millions of dollars to make that switch. Nokia will use Bing for search functionality across its devices, while Nokia Maps will become core to Microsoft’s mapping services. Nokia’s content and app store will be integrated with Microsoft’s Marketplace. More info about the partnership is available here. “MeeGo will place increased emphasis on longer-term market exploration of next-generation devices, platforms and user experiences”. Nokia still plans to ship a MeeGo-related product later this year. The biggest change to the management team: Alberto Torres has apparently stepped down, effective February 10, to “pursue other interests outside the company”. Torres joined Nokia in 2004 and was EVP of MeeGo Computers, Mobile Solutions. As of April 1, Nokia will also boast a new company structure, which features two distinct business units: Smart Devices and Mobile Phones. You can learn more about what that means in the press release below, which will no doubt be ripped apart by press and analysts in the following hours and days (and beyond). When the company recently reported its fourth-quarter earnings, Nokia said its estimated market share had shrunk to 31 percent. With this broad partnership with Microsoft and the organizational overhaul, is a veritable comeback in the cards for the ailing mobile phone maker? London, UK – Nokia today outlined its new strategic direction, including changes in leadership and operational structure to accelerate the company’s speed of execution in a dynamic competitive environment. Nokia plans to form a strategic partnership with Microsoft to build a global mobile ecosystem based on highly complementary assets. The Nokia-Microsoft ecosystem targets to deliver differentiated and innovative products and have unrivalled scale, product breadth, geographical reach, and brand identity. With Windows Phone as its primary smartphone platform, Nokia would help drive the future of the platform by leveraging its expertise on hardware optimization, software customization, language support and scale. Nokia and Microsoft would also combine services assets to drive innovation. Nokia Maps, for example, would be at the heart of key Microsoft assets like Bing and AdCenter, and Nokia’s application and content store would be integrated into Microsoft Marketplace. Under the proposed partnership, Microsoft would provide developer tools, making it easier for application developers to leverage Nokia’s global scale. With Nokia’s planned move to Windows Phone as its primary smartphone platform, Symbian becomes a franchise platform, leveraging previous investments to harvest additional value. This strategy recognizes the opportunity to retain and transition the installed base of 200 million Symbian owners. Nokia expects to sell approximately 150 million more Symbian devices in the years to come. Under the new strategy, MeeGo becomes an open-source, mobile operating system project. MeeGo will place increased emphasis on longer-term market exploration of next-generation devices, platforms and user experiences. Nokia still plans to ship a MeeGo-related product later this year. In feature phones, Nokia unveiled a renewed strategy to leverage its innovation and strength in growth markets to connect the next billion people to their first Internet and application experience. This new strategy is supported by significant changes in Nokia’s leadership, operational structure and approach. Effective today, Nokia has a new leadership team with the commitment, competencies and innovative thinking needed in today’s dynamic environment. The Nokia Leadership Team, previously the Group Executive Board, will consist of the following members: Stephen Elop, Esko Aho, Juha Akras, Jerri DeVard, Colin Giles, Rich Green, Jo Harlow, Timo Ihamuotila, Mary McDowell, Kai Oistamo, Tero Ojanpera, Louise Pentland and Niklas Savander. Alberto Torres has stepped down from the management team, effective February 10 to pursue other interests outside the company. The renewed governance will expedite decision-making and improve time-to-market of products and innovations, placing a heavy focus on results, speed and accountability. The new strategy and operational structure are expected to have significant impact to Nokia operations and personnel. As of April 1, Nokia will have a new company structure, which features two distinct business units: Smart Devices and Mobile Phones. 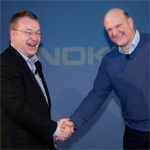 They will focus on Nokia’s key business areas: high-end smartphones and mass-market mobile phones. Each unit will have profit-and-loss responsibility and end-to-end accountability for the full consumer experience, including product development, product management and product marketing. To support the planned new partnership with Microsoft, Smart Devices will be responsible for creating a winning Windows Phone portfolio. Mobile Phones will drive Nokia’s “web for the next billion” strategy. Mobile Phones will leverage its innovation and strength in growth markets to connect the next billion people and bring them affordable access to the Internet and applications. The Mobile Phones unit will be led by Mary McDowell. Markets will be responsible for selling products, executing compelling marketing and communications, creating a competitive local ecosystem, sourcing, customer care, manufacturing, IT and logistics across all Nokia products. It will be headed by Niklas Savander. Services and Developer Experience will be responsible for Nokia’s global services portfolio, developer offering, developer relations and integration of partner service offerings. Tero Ojanpera will lead the Services and Developer Experience unit in an acting capacity. NAVTEQ, an integral part of Nokia’s location and advertising business, will be headed by Larry Kaplan, and continue as a separate reporting entity. The CTO Office will be responsible for Nokia’s technology strategy and forward-looking technology activities, including Nokia Research Center. It will be headed by Rich Green. Design, responsible for Nokia product and user experience design, will be led by Marko Ahtisaari. The CFO Office, responsible for all financial activity, will be headed by Timo Ihamuotila. Corporate Development, responsible for driving implementation of Nokia’s ecosystem strategy and strategic partnerships, will be headed by Kai Oistamo. Corporate Relations & Responsibility, responsible for Nokia’s government and public affairs, sustainable development and social responsibility, will be led by Esko Aho. Human Resources will be led by Juha Akras. Legal and Intellectual Property will be led by Louise Pentland. Nokia Siemens Networks continues in the Nokia Group as a separate reporting entity.